Just a few simple ingredients is all it takes to make this delicious pasta dinner. 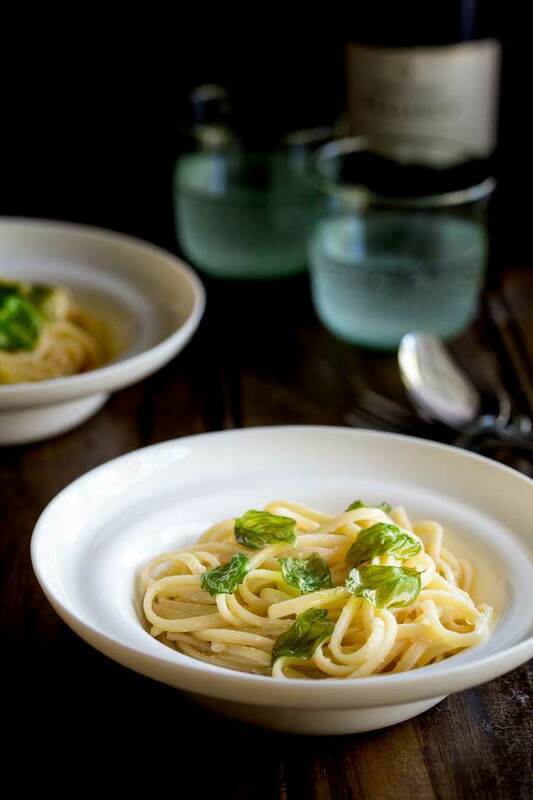 This Lemon Pasta With Crispy Basil is vegetarian, so simple to make and ready in 10 minutes! Yup, 10 minutes people!!! Come on!!! You just know this lemon pasta is sure to be a hit! Did you get here because you read 10 minutes on pinterest and couldn’t believe it??? I promise there isn’t a typo!! Hand on heart this dish takes 10 minutes!!! And you don’t even have to be that organised!!! This isn’t a get everything chopped and in small bowls before you start the 10 minutes. This is a walk into the kitchen and start dinner 10 minutes. The only thing I would say is have the kettle boiled before you start as you know what they say about a watched kettle!! 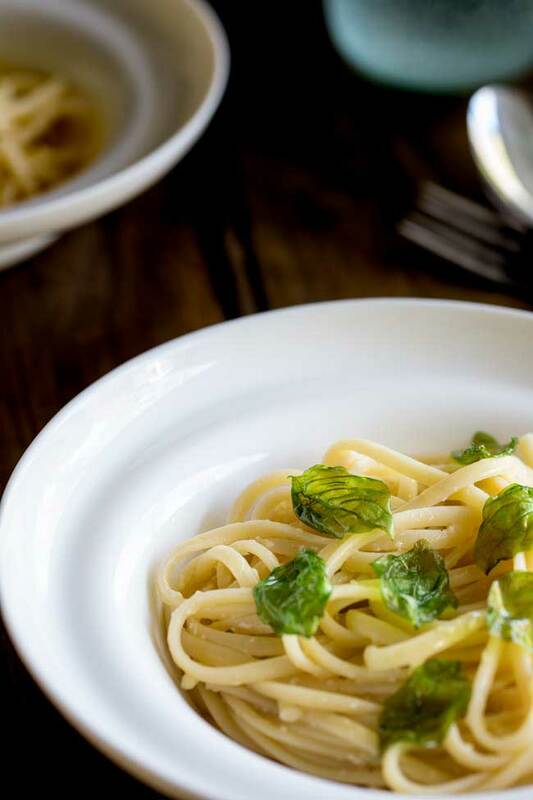 But once the water is boiling you are 10 minutes away from a delicious, delicate and comforting lemon pasta supper. I suppose the 10 minutes will depend on your pasta!!! 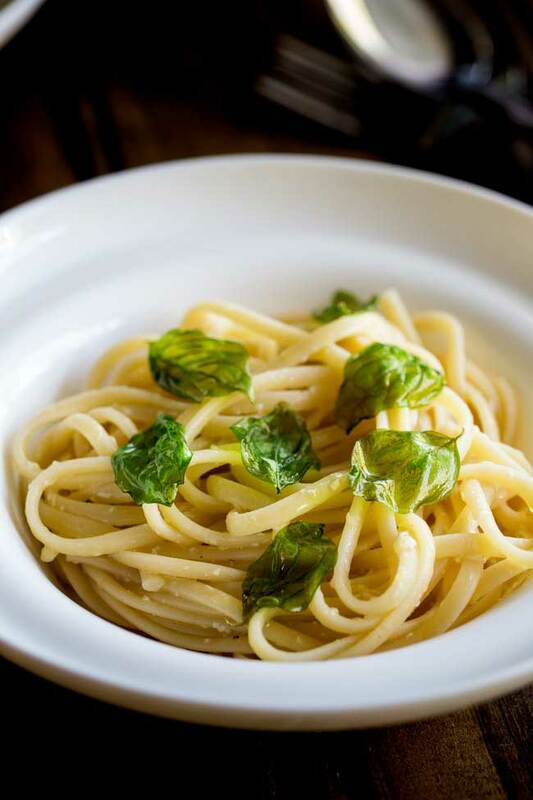 I use linguine as it is my favourite and that cooks in just 8 minutes. But follow the instructions on your packet to ensure you aren’t eating crunchy pasta (YUCK ) Just pick a nice easy pasta that cooks in 8-9 minutes and you will be right on track. I suppose you could pick a quick cook pasta but I always find they fall apart a little!! Fresh pasta would be great here and reduce the time to around 5 minutes!!!! So 10 second run down. We start by frying the basil to make it good and crispy (and so pretty!! ), then get the pasta cooking and whilst it is boiling we make the very simple and very delicious sauce. Drain the pasta, mix it all together and serve. 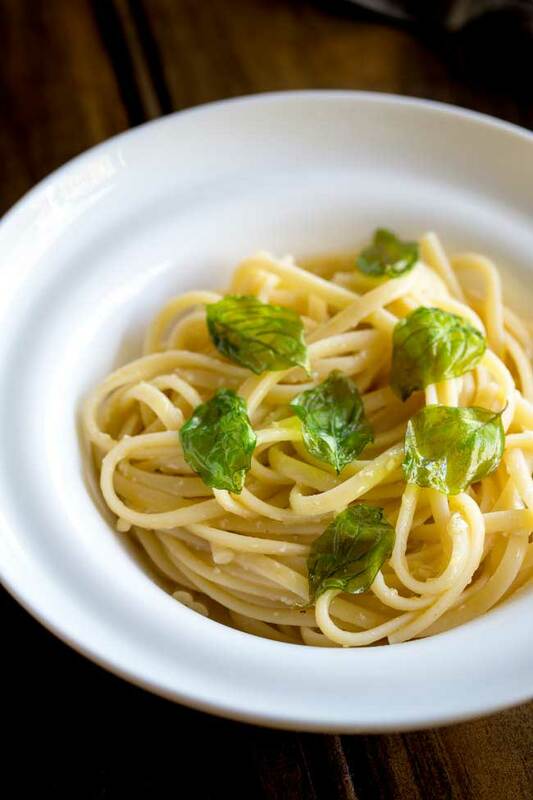 Just 10 minutes and you are eating delicious lemon pasta!!! There aren’t many ingredients in this dish, so you want to make sure the ones you have are the best quality they can be. This means the extra virgin olive oil, the parmesan and the lemons all want to be the best you can afford. Don’t get me wrong, I am not suggesting you spend 20 minutes driving to the best deli you can find (actually mine is 1 hour away!!!) and buy ingredients that will make your simple pasta dish cost more than a meal out!!!!! I do this all with supermarket ingredients, but I buy a good extra virgin olive oil, an aged parmesan and unwaxed lemons. The difference is worth it!!!! The basil is the perfect topping for this dish, it takes seconds to make but looks beautiful and the flavour works so well with the lemon. You could use sage instead! Just a few simple ingredients is all it takes to make this delicious pasta dinner. 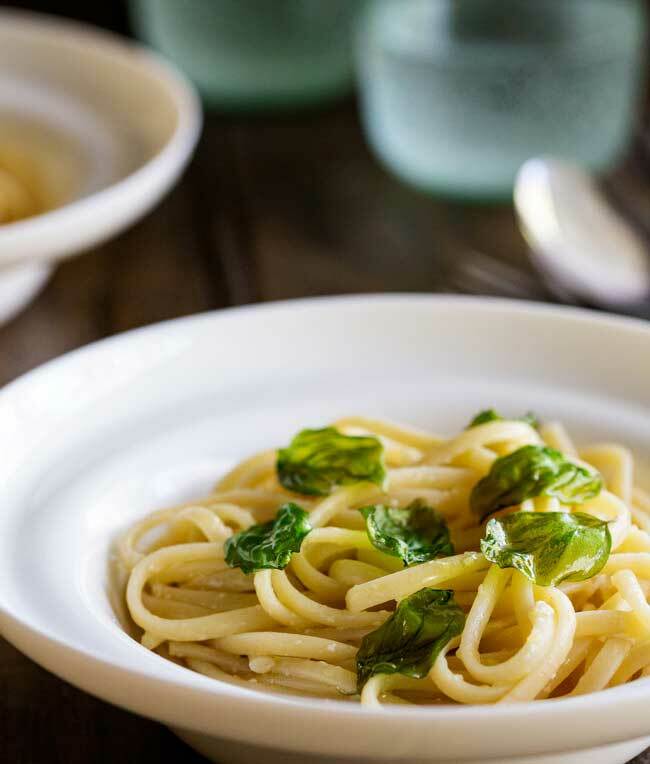 This Lemon Pasta With Crispy Basil is vegetarian, so simple to make and ready in 10 minute! Yup, 10 minutes people!!! Come on!!! 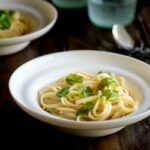 You just know this lemon pasta is sure to be a hit! Place a frying pan over a medium high heat and pour in the olive oil. Once it gets hot add in the basil leaves and let them fry for about 10 seconds , flip them carefully and fry for a further 5-10 seconds and then remove them to a piece of kitchen roll. Remove the pan from the heat but don’t drain away the oil. Add the butter to the cooling frying pan, then pour in the extra virgin olive oil. Set aside. Zest 1 of the lemons (and set the zest to one side) and then cut them both in half and juice them. Whisk the juice and zest into the olive oil mixture and then mix in the grated parmesan. Season the sauce with salt and cracked black pepper. Toss the pasta into the lemon sauce, and add the reserved cooking liquid to thin the sauce to your liking (I add about 1/4 of a cup). Season generous with salt and pepper. Garnish with the crispy basil. I love this simple, yet elegant, recipe. Your photos are stunning. This pasta looks amazing! So simple and full of delicious flavors! Love how simple and tasty this is!